Talk invented languages with Dr. Dimitra Fimi and Dr. Andrew Higgins. 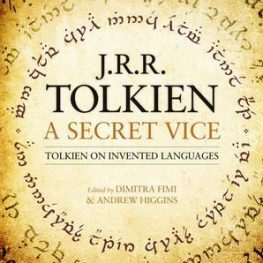 In the Summer of 2016, the latest Tolkien work was revealed: the new edition of A Secret Vice, edited by Dr. Andrew Higgins and Dr. Dimitra Fimi. This lovely new edition of Tolkien’s classic essay contains several brand new discoveries about Tolkien’s linguistic work. This October, hear more about A Secret Vice: Tolkien on Invented Languages, straight from the editors themselves! Dr. Higgins and Dr. Fimi will be giving live presentations on some of their discoveries, and then coming together for a live Q&A session at the end. Join us for this opportunity to hear from and interact with these great Tolkien scholars! In support of this and future seminar series, we have a special sub-goal of $2,500 during our Fall Campaign, which will be matched by a generous anonymous donor if we reach our goal. You can donate to support this sub-goal using the button below. Suggested donation is $20 per attendee for the series. Join us on Mondays from 4 – 5:30 pm EDT.